Biography of MEGHNAD SAHA (1893 – 1956 ) - Robolab Technologies Pvt. Ltd. In 1932, Meghnad Saha moved to Allahabad, Uttar Pradesh Academy of Science was established. He returned to Science College, Calcutta in 1938. 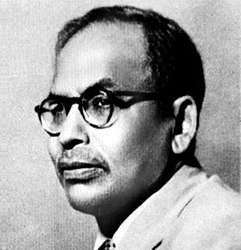 During this time, Saha got interested in Nuclear physics, which later was named after him as Saha Institute of Nuclear physics in the curriculum of higher studies of science. Having seen cyclotrons used for research in nuclear physics abroad, he ordered one to be installed in the institute. In 1950, India had its first cyclotron in operation. He invented an instrument to measure the weight and pressure of solar rays. He produced the famous equation, which he called ‘equation of the reaction-isobar for ionization’, which later became known as Saha’s “Thermo-Ionization Equation”.